'Tis the season for snowball fights, at least if you're lucky enough to live in a part of the world that gets below freezing. Grab some friends, put on your snow-pants, ball up some icy white residue from the footpath, and let it fly. Video games have a history of great snowball fights, and Uppercut Games' SnowJinks hops on that bandwagonwith goofy gusto. It's a simple action game for iOS devices that works a bit like the Xbox game Gears of War, but with kids and snowballs. Each level is something of a shooting gallery, where your character, a rapscallionish boy or girl in snow gear, rolls up on a whole gang of neighbourhood kids determined to take him or her down. They'll shellack you with snow, ice, hose-water, and hailstones, and you'll have to quickly duck and roll behind cover while picking them off one by one. As you progress, the kids get tougher to take down, and come up with all sorts of ways of driving you from cover. The game is a juggling act where you'll constantly be shifting between ducking, dodging, and shooting, and it all comes together very well. It helps that SnowJinks looks great — it's another bright, colourful iOS game based on the Unreal engine (a version of the same engine, as it happens, that powers Gears of War). The bobbing camera, cartoonish colours and smooth animations make this one of the better looking games on iOS, and it looked particularly nice on my iPhone 5's high-res screen. By the fourth or fifth level, you'll find yourself frantically timing your shots to take down an ever-more-complex array of foes, from fast-moving dodgers to icecube-chuckers who take cover to the dreaded water-hose kids, who will freeze you in their tracks if they hit you. There are a bunch of levels to work through, and of course, your scores will be posted on leaderboards so you can compete with your Game Center friends. SnowJinks has a holiday theme, and the levels are also populated with gifts that pop up — if you shoot them, you'll get a bonus item, like a quick health boost or a powerful fireball to throw. Health boosts in particular are very useful, as you'll only get one health bar for each full round. Die and you'll have to start all over again. You can also tap on coins that pop up all over the levels, and if you earn enough you can spend them to unlock different outfits and snowball-types to use, as well as make the present power-ups in the game more powerful. 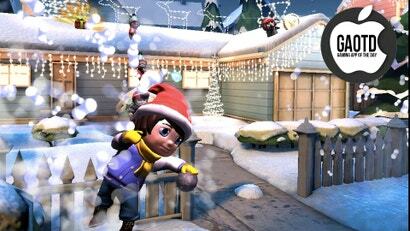 SnowJinks is a frantic and addictive cover-based shooter that just happens to feature little kids throwing snowballs. And hey, after you're done playing, you won't have to shake the snow out of your pants.